I read this article and found it very interesting, thought it might be something for you. The article is called Skoll, Jeff and is located at https://www.medalofphilanthropy.org/skoll-jeff/. In The Gospel of Wealth, Andrew Carnegie urged the wealthy to do “what is practicable now; with the next step possible in our day and generation.” When eBay’s IPO transported Jeff Skoll, the company’s first full-time employee and president, to extraordinary wealth, he began to deliberate the best ways to return his wealth to society. The result is a sophisticated set of organizations that are designed to meet, and are indeed meeting, some of the greatest threats facing humanity. Mr. Skoll was born in Montreal and moved with his family to Toronto when he was 14. At that age his ambition was to become a writer, one whose stories would, as he put it, make “the world feel smaller and more interconnected,” just as many of his favorite authors did for him. Even then, however, he understood that a writing career might require support from a “day job.” Also around this time his father was diagnosed with cancer, speaking with regret of all that he had yet to experience in life. Fortunately, the elder Mr. Skoll recovered from his illness, but this trying period for the family made a deep impression on the son, ultimately helping to propel Jeff Skoll toward academic and professional success. Mr. Skoll earned his bachelor’s degree in electrical engineering from the University of Toronto and an MBA from Stanford University. He then set out to establish himself in Silicon Valley. His early success at eBay set the stage for another phase of his remarkable career, this time in philanthropy. Founded in 1999, the Skoll Foundation is one of the largest organizations in the world committed to investing in, connecting, and celebrating social entrepreneurs. The Skoll Award, for example, has given generous grants to 122 social entrepreneurs at 100 organizations across five continents. With over 80 films to its name, Mr. Skoll’s film company, Participant Media, aims to inspire change through storytelling—earning, so far, 52 Academy Award nominations and 11 Oscars. Meanwhile, with a mission to confront “global threats imperiling humanity,” the Skoll Global Threats Fund focuses on climate change, water security, pandemics, nuclear nonproliferation, and conflict in the Middle East. Capricorn Investment Group invests in breakthrough solutions to the world’s most pressing problems, proving that values-based sustainable investment approaches can enhance return rates. The vision of the Jeff Skoll Group—to “live in a sustainable world of peace and prosperity”—is the bedrock of its founder’s philanthropy. Mr. Skoll’s youthful goal of making the world smaller by uniting people through stories has been brilliantly realized across all of the Jeff Skoll Group organizations, with initiatives that tap into individuals’ idealism and encourage activism. Many of Mr. Skoll’s endeavors have helped inspire positive change in national and international policies, and he has been honored numerous times for his contributions. 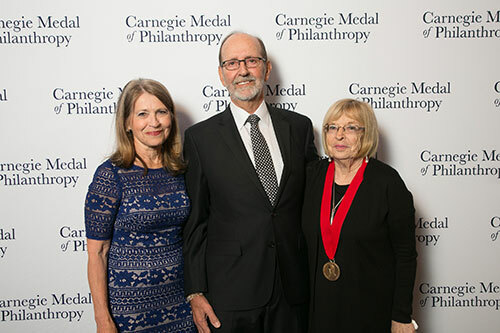 Fellow Carnegie Medal of Philanthropy medalist Eli Broad named Skoll one of “The World’s 7 Most Powerful Philanthropists” in Forbes in 2011, and the next year he was named an Officer of the Order of Canada, a recognition established by Queen Elizabeth II acknowledging outstanding achievement, dedication to the community, and service to the nation. If Mr. Carnegie were alive today, we believe that he would marvel at Mr. Skoll’s organizational talent and visionary philanthropy. 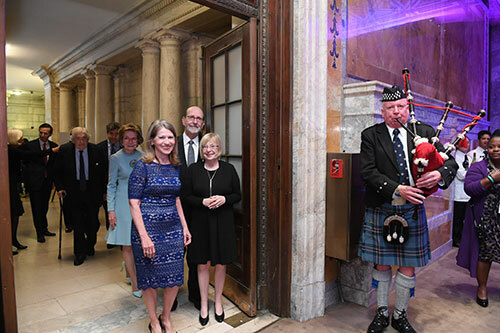 The Carnegie family of institutions applauds the scope of his achievements and his giving, uniting passion, business acumen, and innovation in the effort to create a more just world. 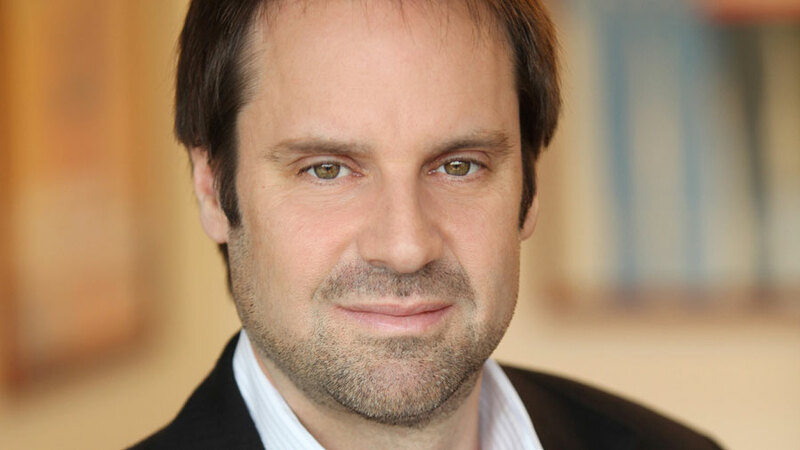 We are privileged to include Jeff Skoll among the recipients of the Carnegie Medal of Philanthropy. 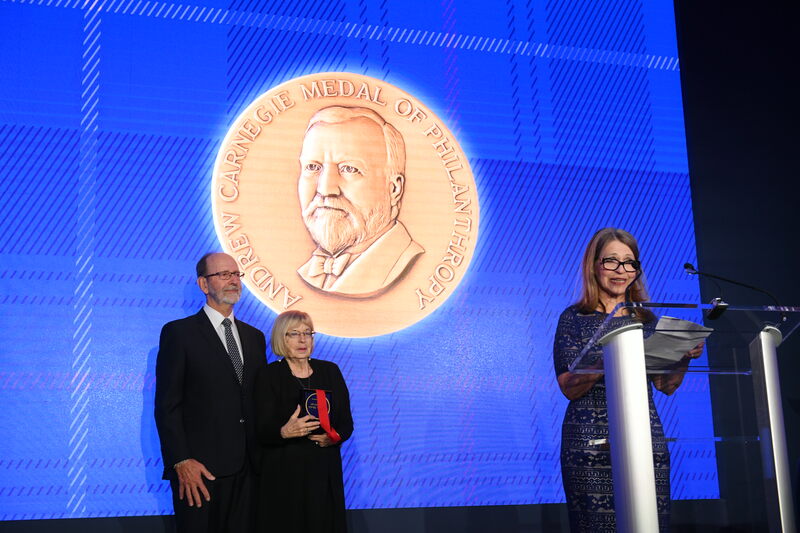 Sally Osberg, Skoll Foundation president and CEO; and Jeff Skoll’s parents, Mort and Judy Skoll, accepting on behalf of Mr. Skoll.